Have peace of mind that you are helping to protect Acadia forever. Preserving and protecting those things you hold dear—the integrity of Acadia’s natural wonders, the park’s unique opportunities to connect with nature, the loving care of Acadia’s matchless trail and carriage road systems—is a wise investment. The easiest way to leave a lasting legacy for the benefit of Acadia National Park is to include Friends of Acadia in your will. The information provided below is meant to assist you and your advisors in planning. Your gift, regardless of size, will be both welcome and important to Friends of Acadia. Thank you. I give, devise, and bequeath the following property to Friends of Acadia, a Maine charitable corporation, for its charitable purposes… [Description of property]. You are strongly urged to discuss your gift intentions with Friends of Acadia at an early stage in your planning. Please call us at 1-800-625-0321, or have your attorney or financial advisor call, if you have any questions or require additional information. If you have already included Friends of Acadia in your estate plans, please complete this confidential statement and return it to Friends of Acadia at PO Box 45, Bar Harbor, ME 04609. The George B. Dorr Society was established in 2005 to recognize those members and friends who have documented provisions for Friends of Acadia in their estate plans. 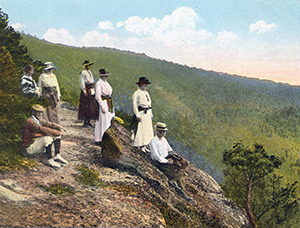 The Dorr Society honors George Bucknam Dorr, gentleman, scholar, and lover of nature, whose dedication to preserving Mount Desert Island helped create Acadia National Park. Each year Dorr Society members gather for a special appreciation event. In 2012, we gathered aboard Bar Harbor Whale Watch Company’s Friendship V to cruise along the shores of MDI and Schoodic with interpretation by Bar Harbor Whale Watch Company’s Zach Klyver and Acadia National Park’s Todd Miller. A picnic dinner was provided by the Jordan Pond House. 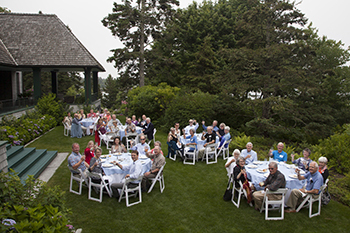 If you have made provisions for Friends of Acadia in your estate plans or would like information about joining the George B. Dorr Society, please contact Lisa Horsch Clark, director of development and donor relations, at 207-288-3340 or lisahorsch@friendsofacadia.org.